Hi friends! It's the last day of November, so the holiday countdown is seriously on! Are you ready? It goes by so fast! We had a few cooler days last week but for the most part it has been really warm in Florida, especially for the last several days, so I really enjoyed pulling out some cool colors for this sparkly, whimsical card. I played with some distress inks, splashes of water and shimmer spray to make the Winter sky background. 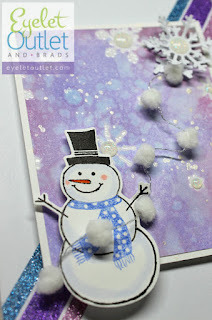 Glitter enamel dots in various sizes make the perfect centers for the sparkly heat-embossed snowflakes. Glitter washi tape in blue, purple and pink add more even color and sparkle, and I couldn't resist a twist of wired pom pom ribbon that I've had in my stash for who knows how long! This cute little guy looks like he's having such a good time! Are you ready for Thanksgiving? This year the prep in our household is all happening last minute because we have had so many other things going on. Our Thanksgiving meal is much more of a production than Christmas, so I'll be in the kitchen nearly every waking moment from now until the food is on the table! Lots of love is being poured into every detail! Keeping a gratitude journal for the month of November has really helped me to realize how much I have to be thankful for, and I love that at this time of year we all become more deliberate about saying so! Little things mean a lot...setting a beautiful table and cooking "family heirloom" recipes are tangible ways to express the love we share for each other! I used a lovely dip pen that I purchased as a souvenir from Venice to calligraph our names on some hand-stamped Thanksgiving place cards. 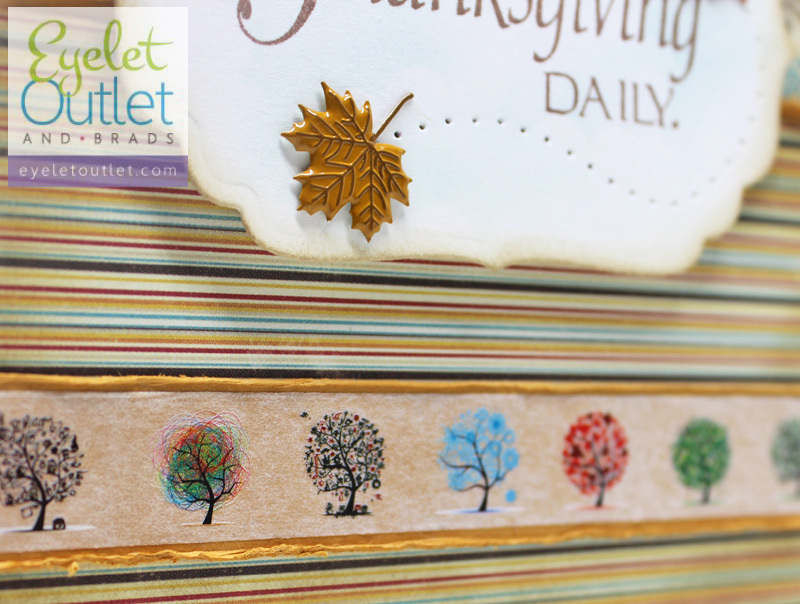 They're simple but the sparkle of gold ink, gold glitter washi tape and the rich colors of the Fall leaf brads make them elegant and traditional. Blessings to you and yours this Thanksgiving, and every day all year through! ...and for every breath, a song! It's such a busy, exciting time of the year! Each season has its own special allure, but this time of year, from October through the beginning of the New Year, is even more special...I love everything about it! This sentiment that really sums it all up for me, and is particularly fitting today since in the past week, I have had three choir practices (for three different choirs) and a ukulele workshop! I love that these songs of joy, thanksgiving and praise get stuck in my head and become like a mantra that helps to keep my heart and mind in the right place. 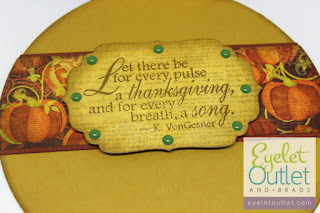 It was fun to make a round card for a change, and even the paper and embellishments include circles everywhere. I used a die that has a circle cut into each scallop, which made spacing those enamel dots a piece of cake! The package includes small, medium, and large dots...it's nice to have options! I'm already looking forward to the weekend, because we have chorale concerts Friday and Sunday. Have a great week! I'll see you next Tuesday! 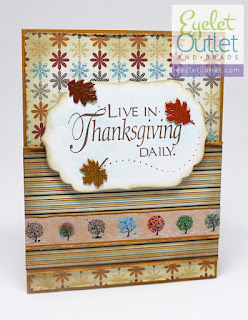 Until then, happy stamping and scrapping! It always seems that Thanksgiving is the neglected holiday, so it's nice to see lots of "30 days of Thanksgiving" posts from my friends on Facebook! I am always inspired and uplifted by their heartfelt reflections of gratitude, and have begun a list of my own in my traveler's notebook journal for November. 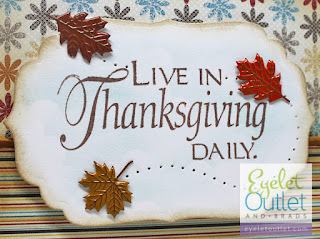 Hopefully the practice will help us all to begin to live in Thanksgiving daily. 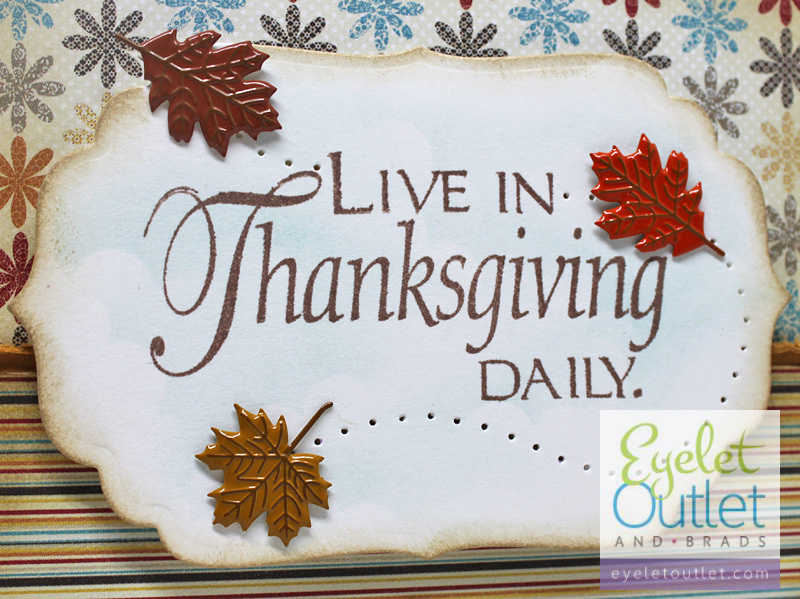 In keeping with the theme of daily thanksgiving, I sponged a sky background and used a trio of fluttering leaf brads to frame the sentiment of today's card. 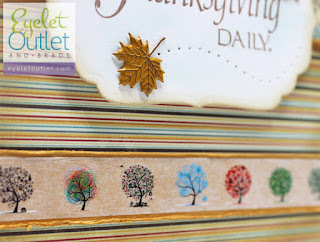 A border of seasonal trees washi tape reinforces the idea of extending Thanksgiving throughout the year. I hope you'll join me in counting your blessings! A hand-made card to show your gratitude takes only minutes to make!